a. Try to download PDF File again: Sometimes when you receive PDF by email or try to download pdf file from, it contains corrupt data. In this case, try to download the PDF again. Copy the file directly to your hard drive to print. b. Save your PDF file with new name: You can save your pdf file by using this option: choose File > Save As with a new name (letters and numbers). Now try to print PDF file. 1. First try to open PDF file in original program. 2. Choose File > Print >save the file as PDF extension. 3. Open the new PDF File & print it again. 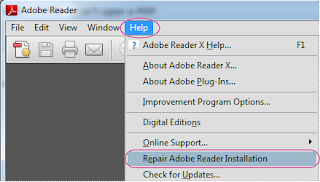 Restart your computer: Sometimes simply restarting your system solves PDF file printing problem & try to print your file again. 3.After installing new update, restart your PC. 4.Try to print your PDF again. Hope this article will help you to print your PDF file without any issue! !